Tomorrow is a big day for NH PoutineFest! Tickets go on sale for our second annual event at 10 AM. We are truly excited. It’s a big milestone in our journey to create a big event for poutine aficionados all over New England. First off, if you attended our inaugural event, thank you. We knew there was a deep love for this Canadian treasure in New England and you helped us show it to everyone. We planned for about 300 and ended up selling out of 1,500 tickets. We had some growing pains, but with the help of our restaurants, volunteers and hosts….we have come up with some great changes. During this year’s event you will have the opportunity to try a healthy scoop of poutine from our restaurants. ALL ingredients are being provided from each of them, because each poutine is a unique creation of each chef. You will see some old favorite restaurants from last year’s event, but also some new ones! There is nowhere else in New England where you will be able to sample so many different types of poutine. 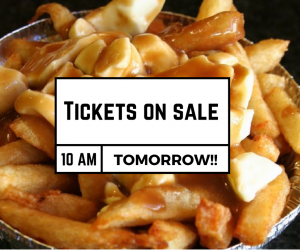 If you want to see what is hot in the “poutine world,” this event is for you. Hi could you tell me how much the tickets are? Thank you! Hi Donna! VIP tix are $40 and GA are $30. More info can be found on our FAQ page.